The true spirit of “Inclusion“ was seen today when children from various schools, including special needs organizations, walked together on Thiruvanmiyur beach as a part of an event organized by Nandavanam – Center of Excellence for Children with Developmental Challenges – to mark the International Disability Day (3 December). 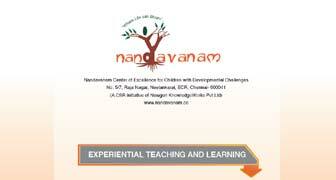 Nandavanam is CSR Initiative of Newgen Knowledge Works. Commemorating international world disability day in a very special manner. Children from Nandavanam day care center, Nandavanam Learners club and Gateway international school, would be taking part in this inclusive event. "Nandavanam Organised Autism awareness campaign at the Newgen offices in the month of April 2017. Hundreads of employees participated in the collaborative art work with the students of Nandavanam center"
Nandavanam in collaboration with Niraivagam conducted a 9 day workshop for over 70 teachers from 20 schools. The purpose of the workshop was to introduce methods used in remedial education to teachers. Nandavanam Center of Excellence for Children with Developmental Challenges organized an Art Duet at the Cholamandal Artists Village. Injambakkam, to commemorate the world Disability day on the 3rd of December. It was an opportunity created for 40 persons with special needs and 46 volunteers to experience the therapeutic effect of Expressive Art firsthand. Nandavanam conducted a half day workshop for its staff on 4th July 2015 on Eurythmy. Eurythmy is “visible speech” and is based on the teachings of Rudolf Steiner. Nandavanam conducted a workshop for a mixed group of people that included teachers, therapists, doctors and social workers from over 7 organisatios between 27th and 31st July 2015. The staff at Nandavanam had a demonstration on a nourishing bath. A nourishing bath is part of external therapy used in the care of children with special needs.